Here at Speedwell, we want to make your customer journey smooth and convenient so that you can book a taxi easily. Your taxi is just a few clicks away when you download our app, making it easier to book a taxi when you’re out and about. Our app is available at no cost on both Android and iPhone. So to download the app for free, just search for ‘ClockTower Cars’ in the app store. Book your taxis in advance or ASAP with our app, so you can request that a taxi arrives in 10, 20 or 30 minutes or enter a specific time. The app will show you a quote for your journey before you complete the booking, giving you reassurance. In addition, you can add in a stop before your final destination, giving you great flexibility with your journey. Use our app, and you’ll have the option to pay by cash, card or by using your account, depending on your preference. So our app is convenient to use and customer-friendly, giving you choice. You can also select your preferred vehicle, whether it’s a saloon or estate car, or one of our executive or luxury cars, you decide. By entering the number of passengers and any specific requirements under ‘driver notes,’ the app shows you which vehicle is best suited to your journey. Whether it is a six or eight seater car you require, one capable of accommodating a wheelchair or a pet-friendly car, we can meet your requirements. The app will also let you know the different prices for each available car so that you won’t face any unexpected charges. At Speedwell, we’ve designed our app to be quick and easy to use so that it won’t use up your time. Moreover, to ensure the booking process is quick, the app gives you the option to save your home address, making any future bookings even easier. You can select your pick up or drop off destination from a range of categories including airports, stations, hospitals, supermarkets, restaurants and other nearby locations, for added convenience. These suggested locations are specific enough that you could select a particular terminal at an airport, as well as specify if you want to meet inside or outside the building. You’ll even have the option to add your flight number, so your driver can track your progress and can be there to meet you at the right time, even if your flight is delayed. The app will also save your frequently chosen locations, making booking repeat journeys, even easier for you. Our cars are all fitted with trackers, for your safety, reassurance, and ease of booking, as the trackers allow you to see which cars are available in your vicinity. The app and trackers will also provide you with an estimated arrival time of your taxi, using your current location or your chosen pick up location. 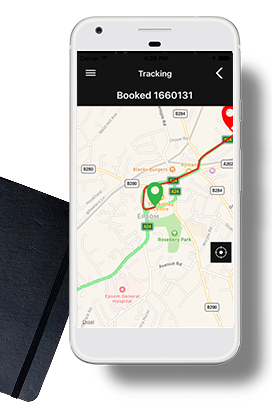 You can track the progress of your approaching taxi in real time and view the route your taxi will take for your booked journey, as well as your estimated arrival time.